The black January for Yemenis by the Saudi-led coalition! Assassination carried out in southern Yemen , under the control of UAE, the main part of the Saudi-led coalition, backed by the US. The cities of Aden and Hadramout are witnessing many crimes of assassinations involving military officials, security officers and clerics by special assassination squads of the UAE and Saudi forces, backed by the US , in the city. In January 2019, Paid fighters , loyal to the coalition, from Al-Mehdhar Brigade killed the taxi driver Majid al-Aghbari in Shaikh-Othman because the driver was wearing a military jacket. Assailants stabbed two citizens: Ahmed Khaled Saleh, who was stabbed in the neck, and another one called Ahmed Fajer, whereas the real motivations behind the crime was not yet known, however, the attackers were confirmed to have a history with hashish addiction. A Yemeni official was survived an assassination attempt in the same province. 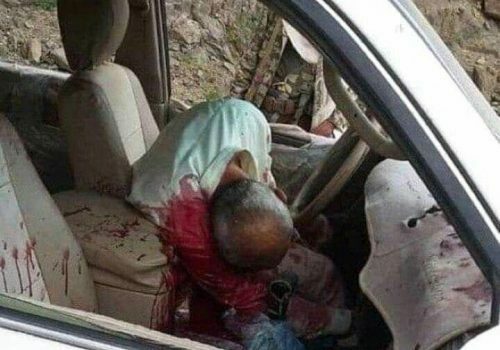 The correspondent in Aden said that the so-called “head Commission for the care of families of martyrs and activists of the Yemeni revolution” in the government of exiled Hadi, “Ahmed Qassem Abdullah” was shot by gunmen in Al-Haswa area of Boriqa district. A young man was found dead in in mysterious circumstances in Yemen’s southern province of Hadramout.The man’s body was recovered inside a room of Trim city hotel. Two citizens were also assassinated by unknown gunmen ,while the gunmen opened fire on the two persons in al-Abr area and fled in the same province. A senior security official was , in addition, assassinated, whereas the director of criminal investigation in the city of Sayoun, Lieutenant Colonel Mohammed al-Somali, was killed on Sunday by unidentified gunmen near the city’s post. Aden has witnessed a wave of assassinations and arrests against many Imams of mosques and clerics who openly criticized the policy of the coalition and citizens in the southern provinces in particular and Yemen in general. Witnesses said that “paid fighters elements stormed the home of the mosque’s imam Ibrahim al-Adani, after he criticized the arrests and raids carried out by the paid fighters in Aden. The UAE-backed paid fighters , furthermore, attacked the house of Tariq Mohammed Bagash, a former detainee was jailed and released from Bir Ahmed Prison, on orders of the Public Prosecutor’s office” in Aden, run by UAE, while Al-Jazeera Net had published photographs of the man who had been tortured during his earlier detention. It is noteworthy that the UAE runs secret prisons in the city of Aden and Hadramout and detain hundreds of citizens and hide their fate from their relatives where they are subjected to various kinds of torture. Popular demonstrations were renewed against the coalition forces in Aden province., whereas dozens of protesters ,calling for the release of the detainees and the forcibly disappeared in the UAE prisons in Aden, and describing the presence of Saudi Arabia in the southern provinces as an occupation. The SAM Organization for Rights and Freedoms has as well as revealed that detainees in secret prison belonging to the first military zone in Hadarmout province, southeastern Yemen subjected to gruesome physical torture, cruel and degrading treatment, and the so-called “Tein” prison, which has been abandoned since 2006.